You know, I don’t I’ve ever met a politician who didn’t love speed bumps. Please allow me to introduce Councilwoman Mary Cheh of Ward 3, who thinks it’s way too easy to get speed bumps installed in neighborhoods throughout DC. 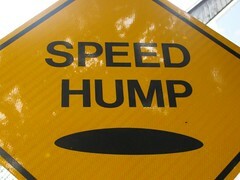 Look, I’m all for safety, too, but the proliferation of speed bumps in DC has just been insane. In two years, there have been nearly 500 extra traffic calming devices installed on DC city streets, most of which were put in without examination of where the traffic would divert to, in order to avoid these devices. Councilwoman Cheh, I salute you.